Upgrading to VMware Workstation 7 shows increased performance over Workstation 6, and it supports both running on and virtualizing Windows 7, unlike Workstation 6. Software companies release upgrades, it's a fact of technology life. Sometimes the older version works just fine, other times upgrading can provide benefits that are more than worth the upgrade. Upgrading to Workstation 7 offers both increased performance and Windows 7 support, both of which are lacking in Workstation 6. Further, if you've already upgraded to Windows 7 and find that Workstation 6 is no longer functional, upgrading Workstation could be your answer. One of the coolest things that you can do with Workstation is to run the new Google Chrome OS inside! Sounds like a cheesy marketing pitch, doesn't it? Well, it's actually true. I just completed my own upgrade to VMware Workstation 7 and I am happy to provide a positive report about it as well. Just a few day after Microsoft released Windows 7, VMware announced Workstation 7. Yes, a big feature is that it supports Windows 7 as a guest VM and that Workstation 7 runs inside Windows 7 as the host OS, but don't stop reading now, as Workstation 7 offers a lot more than just that. 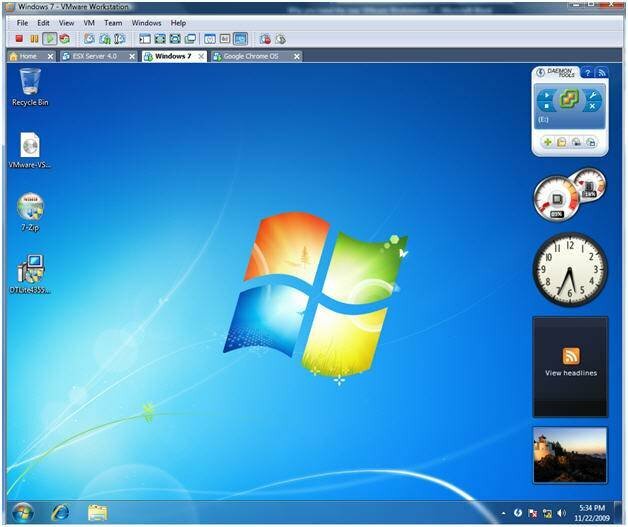 Here is Windows 7 inside Workstation 7. There are a lot of new features in Workstation 7, but here are the top 10. 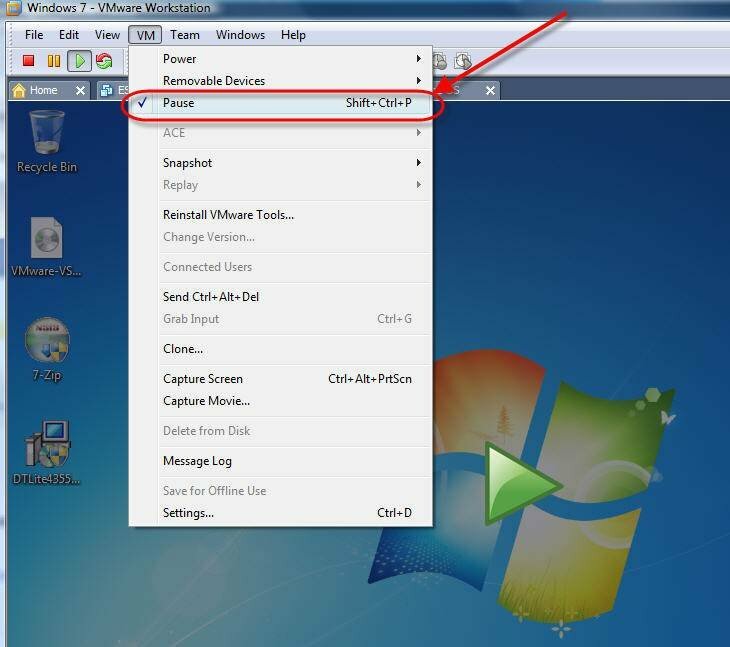 Besides running Windows 7 as a guest VM, Workstation 7 also is able to run Windows 7 in either 32-bit or 64-bit modes. Workstation 7 also works with Flip 3D and Aero Peek to show live virtual machine activity. Run applications that require 3D graphics inside your Workstation 7 VMs (applications like Windows Aero, DirectX 9.0c Shader Model 3 and OpenGL 2.1). For software developers, Workstation 7 streamlines software development and testing with new IDE integrations for the SpringSource Tools Suite and Eclipse IDE for Java and C/C++ along with Record Replay Debugging improvements that make it faster to find non-deterministic bugs. 256-bit Advanced Encryption Standard (AES) encryption for virtual machine files. Driverless printing so that you don't have to load a printer driver in your VM to print to the host's printer. Also, the default printer on the guest VM will be the host's default printer. Autoprotect will automatically take snapshots for you so that you can "go back in time" if an application or OS crashes. Run VMware ESX 4 / vSphere as a guest VM for testing and lab environments. Ability to pause a virtual machine instead of suspending it so that you can quickly free up resources for other VMs or host applications. Contrary to a suspend, it is super-fast to pause a VM and super-fast to un-pause a VM. Finally, Workstation 7 provides the most desktop virtualization power you can find by being able to run 32-bit and 64-bit operating systems with up to four virtual CPUs and 32 GB of RAM dedicated to each virtual machine. Why should you upgrade to VMware Workstation 7? Obviously, there are a lot of changes with Workstation 7, any one of which that could give you justification to start using Workstation 7 or to upgrade from a previous version. The largest reason to use Workstation 7 is if you want to run Workstation in Windows 7 or if you want to run Windows 7 or Windows Server 2008 R2 inside a virtual machine. I use Workstation to run a variety of operating systems on my desktop and laptop PC. I run Windows 7, Windows Server 2008 R2, VMware Workstation 7, VMware vSphere 4, and today I even ran the new Google Chrome OS -- all inside Workstation 7. I used the new Virtual Network Editor to map two or more network adaptors on my PC running Workstation to either the Internet or the private lab networks. Unlike other desktop virtualization applications, I have been very pleased with the performance of Workstation (and especially Workstation 7). David Davis is the director of infrastructure at TrainSignal.com . He has a number of certifications including vExpert, VCP, CCIE #9369 and CISSP. Davis has also authored hundreds of articles and six different video training courses at Train Signal with his most popular course being the VMware vSphere 4 video training course. His personal website is VMwareVideos.com . You can follow Davis on Twitter or connect with Davis on LinkedIn. VMware is offering upgrade specials on Workstation 7. You can upgrade from version 5 to 7 for $99 and $59 for students. You can also upgrade to Workstation 7 for free if you purchased Workstation 6.5 between October 1, 2009 and November 30, 2009. You can find out more information about Workstation upgrades at the VMware Workstation Upgrade Portal.